Does It Matter If There Was Really a Star of Bethlehem? The celebration of Christmas is marked by many symbols, among them the nativity scenes that dot the lawns of churches and homes and the twinkling lights that represent the star said to have illuminated the place of Jesus' birth. While such displays have occasioned recent controversy, they can be traced back many hundreds of years. For example, St Francis of Assisi (1181-1226) is reputed to have been the originator of the Christmas crèche. Of interest to many today is a related question: what truth, if any, underlies the biblical nativity narratives? Was there a Star of Bethlehem that guided three wise men to the birthplace of Jesus? For centuries, astronomers have attempted to connect the biblical account with an astronomical object. Johannes Kepler (1571-1630) conjectured that the star represented a conjunction of the planets Jupiter and Saturn, which he believed had occurred in the year 7 BC. Others have suggested that the bright light in the sky was a comet, such as Halley's Comet, which would have been visible in 12 BC. Still others suggest that a supernova, perhaps in the Andromeda galaxy, was responsible. 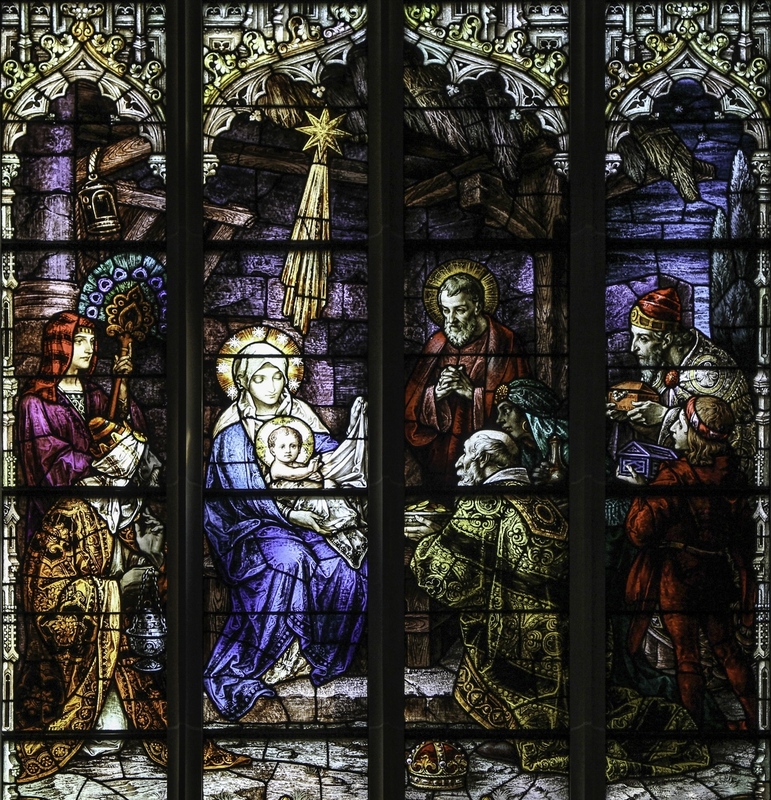 The Adoration of the Magi, Covington Cathedral. Astronomers will no doubt continue to speculate on these matters for many years to come, but the Christmas season offers a deeper question for consideration. Namely, does it matter? What difference would it make to human life if a celestial event were unequivocally linked to the very night of Jesus' birth? This question evokes similar ones: at what location on earth was the Garden of Eden, where can we find the remains of Noah's ark, and what would it mean if historical records were found clearly documenting the liberation of a group of people called Israelites from Egyptian slavery? My point in posing these questions is not to suggest that these events never happened. But how would our understanding of the life and teaching of figures such as Moses, Jesus or Mohammed change if we uncovered irrefutable evidence for the actions and words attributed to them? Suppose we found images produced by the ancient equivalent of a courtroom artist depicting key events of their lives, or more remarkably still, audio and video recordings corroborating scriptural accounts? What would change as a result? To be sure, such discoveries would generate a great deal of interest, as evidenced by the widespread fascination with the Shroud of Turin, thought by some to be the burial shroud of Jesus. But would the existence of such artifacts change the meaning of sacred texts that have been passed down through the centuries? In considering the birth of Jesus, it should be noted straight away that two of the New Testament's four Gospels and the writings of the Apostle Paul are completely mute on the circumstances of Jesus' birth. The Gospels offer differing accounts. An image of The Four Gospels, 1495. 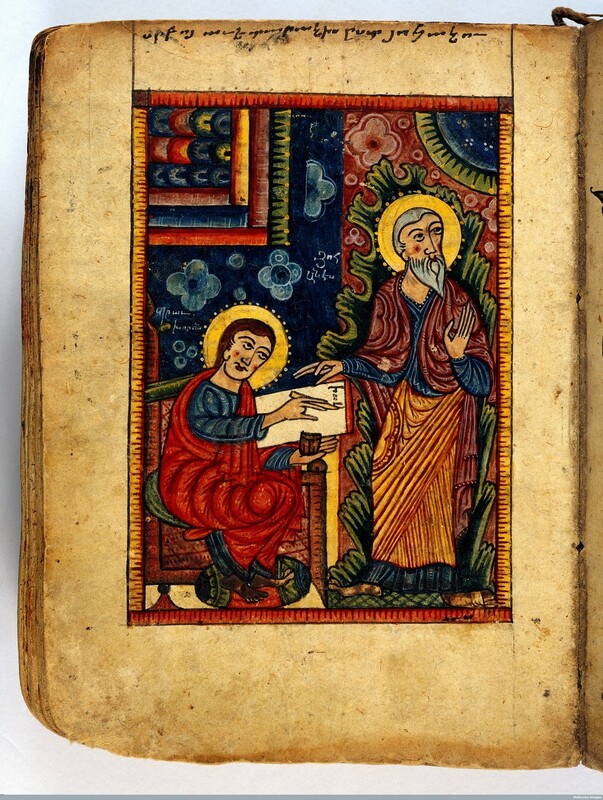 The two Gospels that do address the birth of Jesus provide differing accounts. In Matthew, Jesus' birth is preceded by dreams that come to his father Joseph, paying little attention to his mother Mary. In Luke's narrative, the emphasis is largely on Mary, with little attention to Joseph. Matthew tells the story of the star and the wise men, while in Luke the news of Jesus' birth is shared with shepherds. In Matthew the wise men present gifts of gold, frankincense and myrrh, while in Luke the baby is laid in a manger because there is no room in the inn. The point here is not that the two stories are mutually inconsistent. Rather it is this: the human beings who wrote these texts had different purposes in mind, and these purposes are clearly reflected in their accounts. Matthew is more interested in positioning Jesus in the context of Jewish theology, anticipated by the prophets and situated in a genealogy that stretches back to the patriarchs. Luke, by contrast, is keener to show Jesus' common humanity and to stress that he is a savior for all people. To be sure, it is possible to read the Bible as a newspaper account. Yet literalism is fraught with difficulty, in part because the Bible often tells a story in different ways (such as the two birth narratives of Jesus and the two creation accounts in Genesis), and in part because even those telling the story often seem to recognize that they are operating at the level of myth. Consider, for example, Jesus' parables, many of which are clearly allegorical. Origen, a theologian in Alexandria, pointed out 1,800 years ago that creation could not have taken place over six days and nights, since the Genesis account itself specifies that the sun was not even made until the fourth. Adoration of the Magi with Saint Anthony Abbot. Franco-Flemish Master via Wikimedia Commons. Adoration of the Magi with Saint Anthony Abbot. Franco-Flemish Master via Wikimedia Commons. The stories of Jesus' nativity are not attempting to tell, hour by hour and minute by minute, exactly what transpired on a particular night in Bethlehem. Instead they are conveying that Jesus was not, like the Roman emperors of his day, born into great wealth, power or fame, but was the offspring of ordinary people. Though not heralded by legions, his coming represented a light shining forth in the darkness. They are saying that Jesus came from God, that his life was infused with cosmic significance and that by extension, the lives of human beings even today can serve divine purposes. This does not say that the events recounted in the nativity narratives are false. It does, however, require readers to recognize that these stories were crafted to show who Jesus was and what he lived for. In them, Jesus embodies what is truly worth aspiring to in life - not the conventional trappings of success, but a transformative relationship with God. It is a relationship in which God, not man, is the center; in which human beings are dedicated above all to divine purposes; and in which trust resides in God. When this happens, something beautiful and true is born again in the world.